Probably like many of you, I love photography. I am a little obsessed with taking pictures. 🙂 In the early years of motherhood, after leaving my corporate job to stay home with my babies while my husband traveling most of the time (supporting our family well), I had lots of moments without adults to talk to! It could have been lonely, but I took it all in. And in the moments when my babies wanted me there close by to play, or while I fed them, changed their diapers, and rocked them to sleep, I prayed…a lot. And I took in all the sights, feelings, (smells even) in. I can’t tell you how much I loved being able to be outside in the backyard with the sun shining down through the trees while my babies played, and I thanked God. I thanked Him often, for my husband, for these babies, for our house, and I said I’d never take it for granted, that I get to enjoy all of these precious gifts! I had a camera that I wore out, and then my sweet husband surprised me with an upgraded camera for Mother’s day one year…it is still one of my favorite all-time gifts. Because I get to take in the whole scene in my lens, and capture that moment, forever. 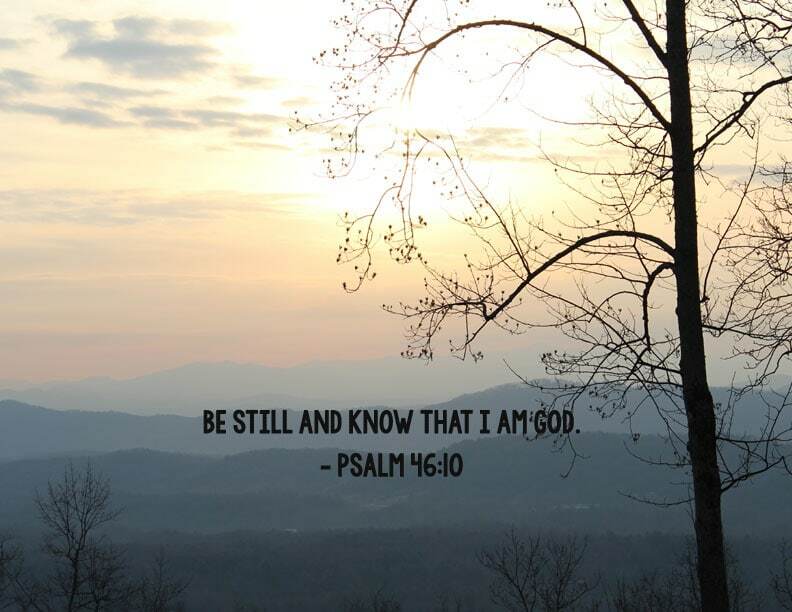 During those quiet times with God, my prayers began to get deeper, and my quiet times longer, and it was a season of God saturating me with His Word. I am so thankful for that time, and now, for those pictures I took, that remind me of what that season was like. Because now, it’s incredibly busy. I never thought I’d say that with two in school but it is!! Our involvement and responsibilities are just that much more, and there’s so much at stake with kids! I have to remind myself to be still, and take it all in. When I do, I realize God’s infinite wisdom and sovereignty and trustworthiness. When I don’t, I doubt, fear, and want to grab back my control over my life, instead of giving it to Him where it belongs. I don’t know about you, but being still is where we find peace, and joy, and faith, and hope, and love, and all of the other good fruits of the Spirit. For more devotionals from Mom’s Priority, click here.